And now, to demonstrate that I am not (yet) deceased, a post. Back on April 30th, I found an adjoining pair of potter wasp nests (likely belonging to Eumenes sp.) while on a collecting trip to Zaleski State Forest with the Ohio State University's undergraduate entomology club. At the recommendation of one of my fellow students, I saved the stout clay pots in hopes that something more interesting than the offspring of their creator would emerge. My hope paid off just one day shy of a month later, when two distinctly non-eumenine wasps emerged, one from each pot: both larvae had been parasitized (females of the Eumenini lay a single egg in each jar; Hermes et al., 2015). Much to my pleasure, the parasitoids I had unwittingly collected were Lycogaster pullata, a member of the small, seldom-encountered family Trigonalidae. Four genera of trigonalids are present in North America (Murphy et al., 2009). They tend to be moderately sized, chunky wasps with unreduced wing venation and >16 flagellomeres, distinguished from other apocritans of this description by finger-like ventral projections at their tarsomeres' apices and reduced ovipositors in females (Goulet & Huber, 1993). Distinctive enough to warrant their own superfamily, trigonalids are currently regarded as most akin to the Megalyroidea (Heraty et al., 2011). 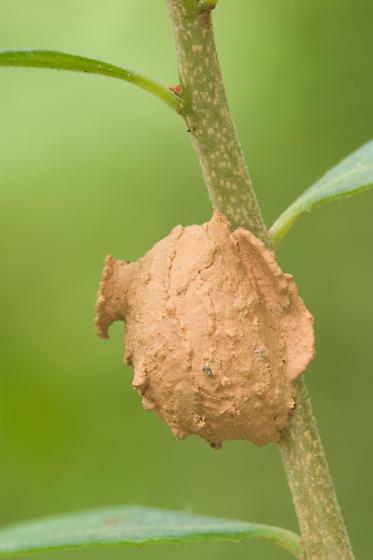 The reduced ovipositor is a consequence of the wasps' distinctive biology, the convolutions of which are at least partially responsible for their rarity: rather than lay eggs directly upon or within their desired hosts, trigonalid females oviposit large quantities of minute eggs in foliage, where they are ingested by herbivorous sawfly and lepidopteran larvae. This strategy is not unique, but trigonalids add a bizarre wrinkle in that they are for the most part obligate hyperparasitoids, attacking ichneumonid or tachinid larvae that are themselves parasitoids of the insect that originally ingested the eggs (Murphy et al., 2009). L. pullata has been reported both as a hyperparasitoid, and as facultatively employing a different stratagem—the one employed by the particular specimen I collected (Smith, 1996). 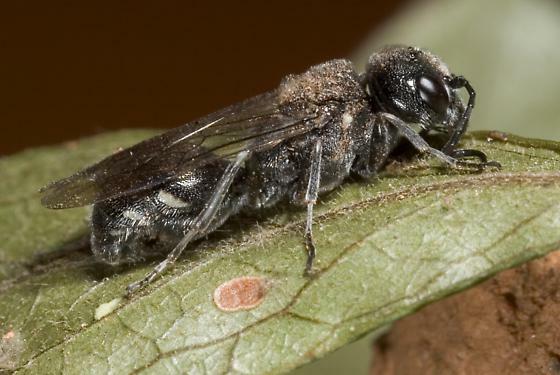 Namely, it (and other trigonalids) may parasitize the larvae of vespid wasps (including eumenines) that provision their nests with caterpillars, infesting these hosts through inadvertent larval ingestion of minute trigonalid larvae that had hatched within said caterpillars. Evidently, one should thoroughly chew one's food. Goulet, H and Huber, J. T. (1993). Hymenoptera of the World: an Identification Guide to Families. Ottawa: Agriculture Canada. Heraty, J.; Ronquist, F.; Carpenter, J. M.; Hawks, D.; Schulmeister, S.; Dowling, A. P.; Murray, D.; Munro, J.; Wheeler, W. C.; Schiff, N.; and Sharkey, M. (2011). Evolution of the hymenopteran megaradiation. Molecular Phylogenetics & Evolution, 60, 73-88. Smith, D. R. (1996). Trigonalyidae (Hymenoptera) in the eastern United States: seasonal flight activity, distributions, hosts. Proceedings of the Entomological Society of Washington, 98(1), 109-118.